The archaeological excavation and surveys was undertaken during the first two weeks of August 2010, with warm and reasonably dry weather conditions throughout. While the excavation comprised one single trench, it was staggered down the slope so each section of trench was given a separate number. 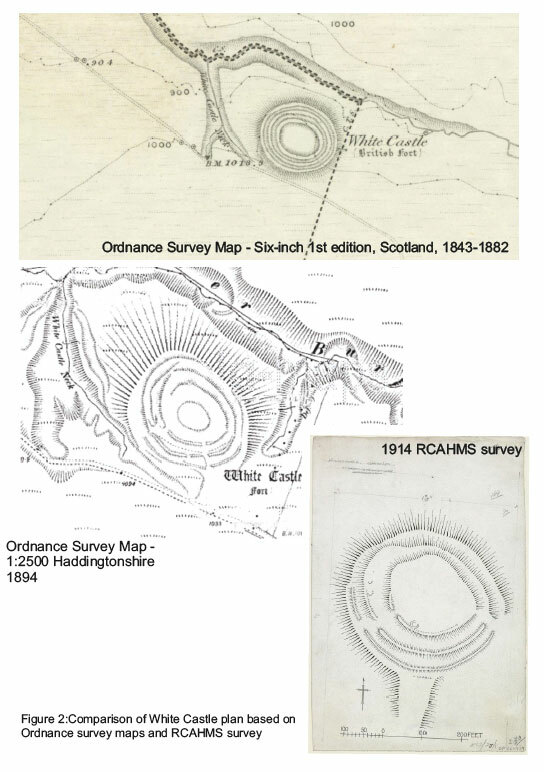 The initial survey confirmed the basic nature and shape of the site, and the presence of the three previously known internal features (house platforms) that are recorded on the RCAHMS plan. This time, considerably greater detail has been recorded, and the total number of recorded potential hut platforms has now been increased to 17. This excludes the previously identified rectilinear features within Rampart 1, which clearly overlies it and is now thought to be a Medieval-Post-Medieval shieling (shepherds hut). Within the assemblage of hut platforms, there are clearly two distinct sizes: c 4-5m in diameter and c 8-9m. It is clear that the platforms are clustered to the north-west and west sides of the site. All of the ramparts are more impressive on the southern side and there is no clear trace of the inner rampart to the north of the site, or of the outer rampart to the west of the site. In addition, Rampart 3, continues further to the south-west than previously recorded. At the south-western entrance Rampart 3 appears to comprise of two rounded mounds and it is unclear if these are deliberate features, possibly incorporated into or built on top of Rampart 3 or the result of differential rabbit erosion. The south-east entrance (?) identified by previous surveys, is now interpreted as a breach corresponding to the change in nature of the ramparts from the south to the north of the site. A full Erosion survey took place to constantly monitor the damage to the site over the next 5 years. 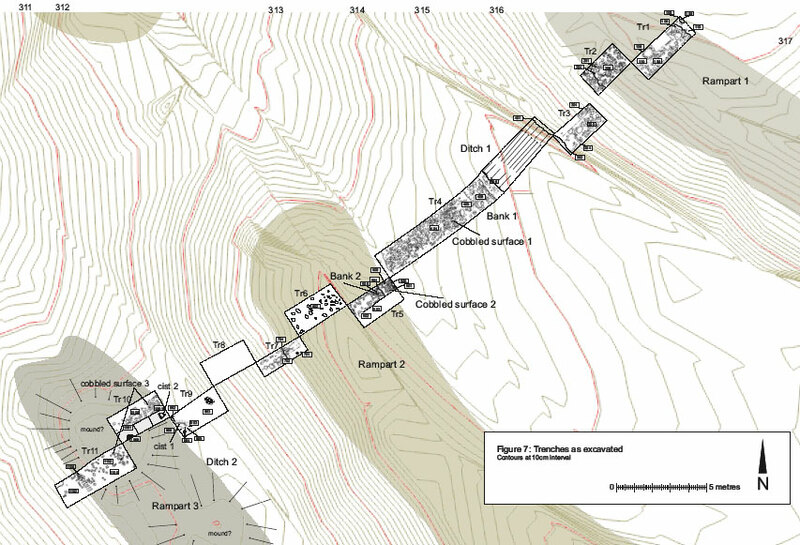 Site plan of trenches, with Geophysical , topographic and survey results. 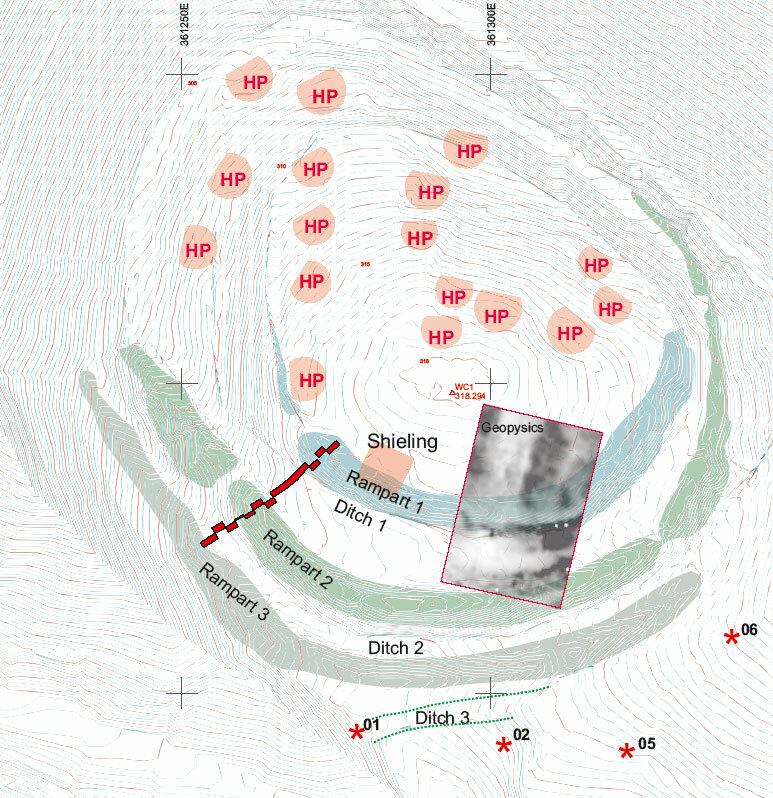 The resistivity clearly showed differential features across the interior and the banks and identified three different sets of anomalies which appear to have archaeological significance. The second example is the large high resistance anomaly between Ramparts 1 and 2 on the east edge of the survey area, which suggests a stone footing in a rectangular pattern. Within the interior it is unclear whether the pattern of high and low resistance represents geological or anthropogenic features, however, there does seem to be a correlation between topographic features and these geophysical features. As identified by previous surveys, White Castle’s defensive sequence is dominated by three ramparts, Ramparts 1, 2 and 3, each of which was located on the break of a slope, and two ditches (Ditches 1 and 2). However, in addition, to Ditch 1 being significantly deeper, two banks, (Banks 1 and 2), a third ditch (Ditch 3); three cobbled surfaces (Cobbled Surfaces 1, 2 and 3). Rampart 1 comprised a stone and soil dump between two sets of edge set kerbs, it is interpreted that a large volume of Rampart 1 collapsed into Ditch 1. Ditch 1, which measured 2.3m wide and 1.4m deep with a reversed ‘J’ shaped profile, was cut into the natural side of the hill. Bank 1 was located on the outer edge of Ditch 1 and measured 1.1m and 0.15m thick and abutted Cobbled Surface 1. It is argued that Bank 1 was deliberately constructed to mark the boundary between Cobbled Surface 1 and Ditch 1. Cobbled Surface 1 overlay and resurfaced Cobbled Surface 2. Cobbled Surface 1 abutted Rampart 2 which comprised a dump of soil with a kerb to the outer edge and measured 4.4m wide and 0.7m thick. Rampart 2 also overlay Bank 2, which measured at least 1.3m wide and 0.4m high and abutted Cobbled Surface 2. It is argued that Bank 2 served to mark the edge of Cobbled Surface 2. The precise extent of both Cobbled Surfaces 1 and 2 are unclear. It is argued that Banks 1 and 2, along with Cobbled Surface 2 acted as a formal path/track into Rampart 1. Ditch 3 may have acted to defend this approach. Rampart 2 clearly post-dates Bank 2 and Cobbled Surface 1 and it is argued that its construction led to a reorientation of the formal approach to Rampart 1’s entrance and thus the abandonment of Ditch 3. However, the function of Cobbled Surface 1 is uncertain, but presumably it acted as hard standing around the entrance to Rampart 1. At the base of Rampart 2 lay Ditch 2, which was not fully excavated, but measured at least 2.2m wide and 0.6m deep. Rampart 3 was constructed on Cobbled Surface 3 and thus over the fill of Ditch 2. It comprised a dump of soil with a retaining kerb to the outer edge and measured 3.6m wide and up to 0.25m thick. David and Murray would like to thank the Monks from Sancta Maria Abbey for their kind permission for letting us excavate on their land; Becker Geomatics Ltd for the topographic survey; the Girl Guide Association for the use of Alison Cargill House; the technical wizardry of the Edinburgh Archaeological Field Society with their geophysical expertise; the guidance of Rory McDonald; the advice of the East Lothian Council’s archaeological team; and last but not least the participants who endured and enjoyed the full gamut of an East Lothian Summer: Eric, Maggie, Alan, Mary, Gale, Lydia, Rae, Ron, Dave, Nataly, Allison, Andy, Amanda, Julie, Gwynne, Maureen, Jenny and Erin.